Here at everythingbiorb.com we believe that the unique filtration of the BiOrb fish tanks is what sets these tanks apart. A beautiful Biorb fish tank that looks elegant in your home or office and requires less maintenance and leaves you more time to enjoy your tank, how is this a bad plan? One of the best aspects of a BiOrb fish tank is the filtering system that keeps your tank clean for long periods at a time. The BiOrb tanks spherical shape helps with the filtration system. As the air from the BiOrb air pump pushes the water up out of the BiOrb bubble tube and reaches the surface of the water. The current of the water then pushes the water out and down to the bottom of the tank. The diagram below illustrates the cleaning benefits of the BiOrb Ceramic Media and the BiOrb Service Kit. The filtration system does an excellent job of maintaining the cleanliness of your tank but that does not exclude you from doing your part. Approximately every 4 to 6 weeks you will need to change out your BiOrb service kit. Along with that, a 20-30% water change will be necessary. While you change the water you can wipe down your tank with the BiOrb cleaning pads and remove any sludge that might have attached to the side of the tank. If you have any built up algae we have a wonderful BiOrb algae cleaner to help get rid of that. Lastly, it is wise to use the BiOrb siphon hose in order to get any gunk that has built up at the bottom of your tank. If you clean your tank on schedule you will have a good looking tank with happy and healthy pet fish. Cleanliness of your tank is a vital aspect of your pet fish’s health. If your BiOrb tank is contaminated the chance of your fish getting sick increases. Once your pet fish gets sick you might need to buy fish antibiotics to help nurse it back to health. Avoid unnecessary heartache and costs and maintain a clean BiOrb fish tank. Do you love your Reef One BiOrb or BiUbe fish tank but don’t love paying for an expensive filter replacement every month? We have come up with a solution for you! Seahorse Enterprises, the parent company that runs the EverythingBiorb.com website has put together their own replacement filter kit for all BiOrb and BiUbe tanks. 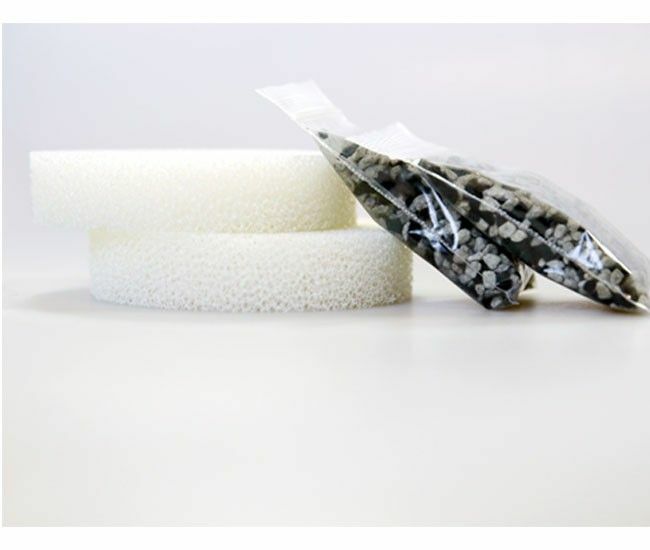 Our replacement filter kit comes with the foam and media and allows you to re-use your plastic filter cartridge to save you up to 70% on replacing your Biorb Filter. We have had many customers request a maintenance solution that allowed them to replace only the components of their filter that were worn out, and they were willing to reuse the sturdy filter cartridge inside their tanks when they service their aquariums. To meet that request, we developed a replacement kit that encouraged both recommended and frequent maintenance without all of the extra cost. 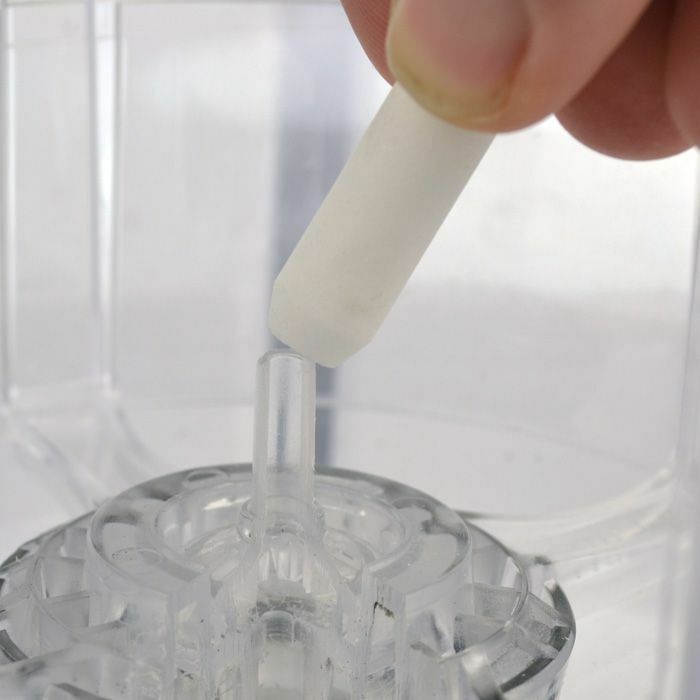 The foam in our Biorb Replacement Filter Kit is non-toxic and along with the carbon packets function to reduce the ammonia, toxins, sludge and even odor that comes along with a fish tank. We have more alternatives to your BiOrb Service Kit Filters. The filter cartridge in your biOrb™ aquarium should be changed every 4-8 weeks. Frequency of filter changes depends on the size of your biOrb ™ and the fish stocking level. Remove existing filter from tank during your next maintenance water change (20% water removal). Open cartridge and discard foam and carbon media, saving plastic cartridge. Empty one new media packet into cartridge, followed by one foam filter. Reassemble filter and place back in tank. We are proud to announce that we now carry the full line of Thomas Labs Fish Antibiotics & Medicine. When you purchase a biorb aquarium we know it isn’t just a purchase, it is an investment. There is a reason that you picked a biorb aquarium over a regular fish tank. Biorb Fish Tanks are more expensive than regular aquariums, but they offer a lot more than a square box to look at fish through. A biorb aquarium can change the entire look and feel of your apartment or office. We know that since you chose a biorb aquarium you have excellent taste and you don’t want your fish to die. That is why we have added Fish Antibiotic Medicines to our products selection. Fish Antibiotics such as Fish Mox Forte & Fish Flex are great medicines that eliminate bacterial infections in reef and freshwater aquariums. They come with dosage and administration instructions for fish tanks and can be bought in dozens of medications and sizes. See a full list of the fish medicines that we carry below, and next time one of your fish is sick, find out if one of our fish antibiotics will save its life. Biorb tanks are different, in several ways, from standard aquariums. So, even if you have set up a fish tank before, if you are a first time Biorb or Biube owner, you will need to know some basic differences before you set up your tank. Biorb and Biube tanks now come in many sizes and different shapes. Whether you are starting a small one, or a larger one, these instructions will help you treat your Biorb or Biube correctly. One of the best things about these tanks is how lightweight and surprisingly durable they are. Acrylic is much lighter than glass, but at the same time less breakable. Carrying your Biorb or Biube tank full of water is actually possible. Even the 16 gallon tank full of water is only 132 pounds, a weight that can be carried by most men. The Biorb or Biube tank comes with filter, air pump, halogen light, water conditioner, ceramic media and fish food all included. Check to make sure that, as listed in the instructions, all pieces are there. Start by treating the water. It usually needs to sit overnight. Put the air stone where the instructions indicate and gently press it in. Then, the filtration unit needs to be placed over the air stone. Tighten this by turning it counter-clockwise until it is firmly placed. Then, make sure the ceramic media has been rinsed and place that around the filter on the bottom. Place some of the treated water into the tank, just above the bottom, so you can still place your decorations. Pour in the bottom decoration you have chosen, like stones or pebbles. But gravel and sand are not appropriate for the bottom filter, in a Biorb or Biube, as they could clog it. Now you can place your decorations and finish pouring in the water. After about 24 hours running, you can test the pH and see if it is safe to add your fish. Many people use their aquariums as a focal point in a room. In hopes of adding to the interest of the conversation piece, some fish owners will place found objects inside the tank as decoration. While this may give the fish tank a truly unique look, it can also be very dangerous to your fish. First of all, found objects are usually not clean. Bacteria is not the only problem as chemicals like cleansers, petroleum products, or other toxins may have been used on the object and still be present. It may be difficult to fully cleanse the item from potentially hazardous residues. Secondly, certain objects may degrade or dissolve slowly, in the water. If an object softens in the water, the fish could nibble at it, making them sick, or it could release toxins into the tank. Plastics, for example, generally release chemicals ever-so-slowly into the water. A third concern is the pH level of objects one might place inside a tank. Maintaining the proper pH level is very important for the health of your fish. Surprisingly, even objects that seem natural to a fish environment, like shells, wood, or coral skeletons can negatively affect the pH of the tank. The concentrated environment of a tank does not allow for some items that may not affect fish living in streams, lakes, or the ocean. Finally, items that are found can have rough edges, sharp points, or potential trap-hazards for your fish. A rough item may be fine for a while, until something startles one of the fish and it injures itself against a rough edge. Items that are manufactured specifically for decorating fish aquariums are the safest choice, when creating the environment inside your Biube or Biorb fish tank. Biorb and Biube fish tanks are well-known for their aesthetic appeal. While they have additional benefits of being more self-maintaining and easier to clean than other tanks, most people are drawn to these unusual tanks because they are so much more attractive than a typical tank. Biorbs and Biubes can be a focal point and conversation piece in any room. With its aesthetic qualities being so important to a fish owner, decorating your Biorb or Biube fish tank can either be the pinnacle of your new visual centerpiece, or look like a decorating disaster, depending on your choices. Start with the basic look you are going for. Keep this plan in mind when you select plants for the tank. What color scheme would you like for your substrate? You could choose natural colors like browns, blues, and greens, or perhaps monochromatic decorations with black and white. One thing to remember is that even decorating isn’t just about beauty. Using gravel as a substrate, for example, can help maintain healthy bacteria in the water. Fish thrive in a well-decorated tank because their environment feels more natural. Lower stress and more comfort lead to healthier fish. Fish feel exposed and in danger when they dwell in a sparsely decorated tank. Real plants can add natural filtration while colorful pre-made decorations can add personality. Avoid using real shells, as they can slowly raise the pH level of the water. It is recommended that you only use items manufactured especially for aquarium use. As long as you provide sufficient cover for your fish (with about one 1/2 to 3/4 of the tank floor providing shelter) the color choices are up to you. And once you have placed the decorations, remember to treat the water and let it sit for 24 hours before introducing any fish. Lighting is a part of setting up a Biorb or Biube tank to which many people do not give sufficient attention. All lights are created equal, right? Well, with fish tanks, light is more than just a way to view the fish. Light actually affects the temperature and even the algae growth in the tank. There are different types of lighting you can choose from, for your fish tank. Starting with LED lighting, these bulbs rarely require replacement. The light from an LED lamp is usually dim enough that it can be used overnight. Nocturnal fish will feel at home with the night-like atmosphere. Lunar LED lights mimic the look of moonlight over the water. Fluorescent bulbs are perhaps the most common lighting used in fish tanks. They will not generally cause a problem with heat, and can be found readily when replacement is required. Fluorescent lights, like LEDs, save energy over other types of bulbs. However, fluorescent lights can encourage algae growth. Those tank owners who leave their aquarium lights on may be surprised that only days after cleaning, they are noticing algae spots and murkier water. It is recommended that this type of lighting be turned on only for the periods of time it is used and left off most of the day. Finally, specialty lighting is available for those who want to actually house a miniature reef inside their aquarium. Metal halide aquarium lighting provides superior intensity for maintaining coral, than LED or fluorescent lights. Coral requires so much light, that owners should plan on one bulb for every 4 square feet of tank water. With metal halide aquarium lights, the heat produced can significantly raise the temperature of the water. So, using a fan system designed for tanks with this lighting will help. Also, turning the lights off for the recommended 12 hours per day (or night) can help keep the tank from overheating. Planning the right lights for your tank can save you a great deal of cleaning, frustration, and expense. Aquarium fish aren’t very interactive pets. Perhaps the only interaction you’ll have with them is feeding them and taking them in and out of the aquarium for tank cleanings. Feeding the fish is what most people enjoy the most. It probably will not come as a surprise, therefore, that overfeeding is the number one cause of aquarium problems in the United States. Overfeeding can not only make the fish sick, but it can dirty a tank incredibly fast. When feeding your fish, keep in mind that fish do not need to keep their bodies warm, like we do. They live in and with the temperature of their tank and thus do not need the energy it takes to produce internal heat. Fish eat much less than most people realize. So, start by putting in several flakes, not a pinch, which probably contains too many flakes. Just put in several and watch the fish eat. After they finish the first several flakes, you can add several more. If they eat those greedily, you can add a third portion. When they lose interest or eat and spit the food back out, that should signal you that your fish have had enough to eat. Watch for these signs of overfeeding: 1) The tank has a “fishy smell.” 2) Uneaten food is left in deposits around the tank. 3) Algae growth is reddish or brown/black, rather than green, 4) The water tests positive for ammonia content, 5) The water is cloudy instead of clear, and 6) The filter needs changing more frequently than is customary. Yes, fish get sick too. And sometimes, fish don’t get along. You may wake up one morning and look in your fish tank and see one with a fin half bitten off, or just swimming abnormally. Believe it or not, there is something you can do for a sick or injured fish. You will need a bucket or a small spare aquarium for the job. Make sure you start with temperature adjusted and treated water. The last thing a struggling fish needs is a temperature shock or untreated tap water. Follow the directions for adding aquarium salt to complete the water conditioning process. Also, use a clean filter for the bucket or aquarium. Your fish may need to use a fish antibiotic solution like fish mox or fish flox forte. Consider using a natural treatment like Melafix, which is made from tealeaves. You can use 2-3 times the recommended amount of the antibacterial solution and taper it down as your fish begins to recover. Try not feeding your fish for a couple days. Digesting takes a great deal of energy, detracting from the healing process. If your fish really begins to struggle, and if it is a fish you really care about, you can help it around the water for a while by gently moving him through the water with your hands. This will give your fish a break from trying to swim, while keeping it oxygenated. This process has helped save some fish, but obviously it is a time-consuming task and is only worthwhile for someone who is really invested in saving a fish. You can soak fish food pellets in some olive oil and an antibacterial gel or powder, designed for that purpose. Just make sure you dry off the pellets with a napkin or other absorbent material, before you drop it into the water. As long as your fish is isolated for healing, change the water every day. Make sure, of course, to provide it with properly heated and treated water. Be very gentle during the water changes, to avoid stressing the fish. Once the fish is acting normally again, and any visible wounds are healed, you can return it to its original tank.